Nosebleeds are very common in contact sports. 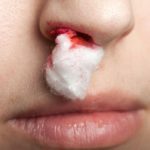 Bleeding usually comes from blood vessels towards the front of the nose. Sit player upright if possible. Place your thumb and index nger over the player’s nose and pinch the nostrils together for about 10 minutes, after which bleeding will stop in nine out of 10 cases. Keep the players head bent forwards rather than backwards. 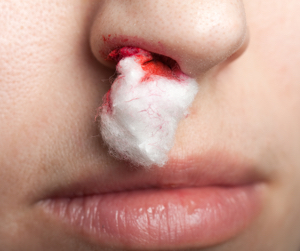 Put a ball of cotton wool or a compress in the player’s nostril for about one hour. Apply cotton wool soaked in adrenaline (1:1000) to the nasal septum if available. See a doctor if the bleeding continues in spite of the above measures or if there is deformity. Nasal fractures (broken nose) are very common. In young players, displaced fractures are almost always reduced (put back in place) to subsequently reduce the risk of sinus infections and a decrease in the size of the nasal passage. Deformity – nose looks crooked. Mobility of the nose . When swelling develops around the nose it may not be obvious if their nasal bones are displaced. After an examination by a doctor. Obstruction of the nasal passages. Cosmetic deformity – look out of place. Do Not attempt immediate reduction (push back in place) of nasal fractures at the pitch side. When the soft tissue swelling has settled, reduction can be carried out by a qualified professional.